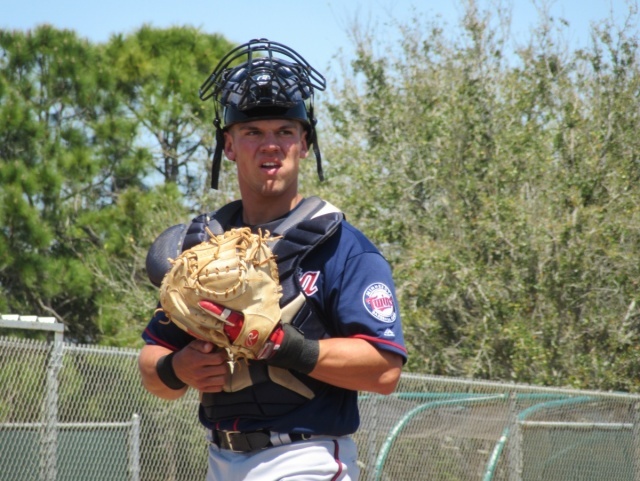 Ben Rortvedt, Twins Daily's 19th ranked prospect, is a catcher who will go as far as his bat takes him, because by most accounts his defense will be major-league ready very soon. 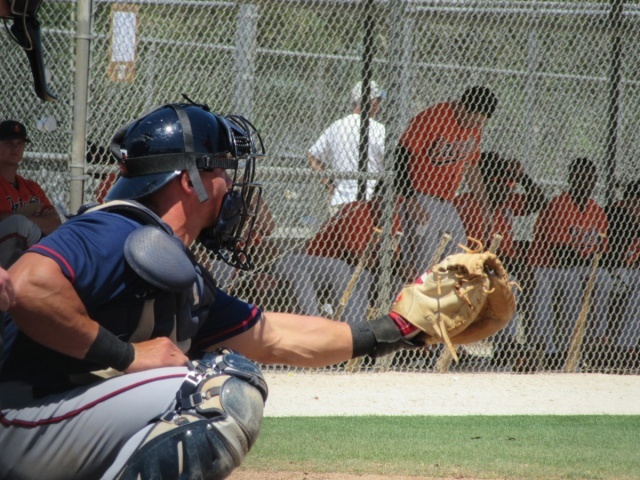 Ben looks very smooth and assured behind the plate, with a low, quiet, and athletic stance that I have to believe will be looked on favorably by umpires (by making their job easier) as well as by talent evaluators. He also has a strong and accurate arm, which I witnessed put to good use in one of the minor league games in Spring by gunning down a couple of would-be base stealers. His bat is another story, and fresh from high school he did not have an easy time of it in rookie ball, posting only a .222 batting average across the GCL and Appy League (Ft Myers and Elizabethton, respectively). On the plus side, he showed an ability to draw a walk (10 in 113 plate appearances), and also did not strike out inordinately (10 also). He must like the number 10 because that's also how many RBI he had, meaning that he provided pretty good production from the hits he did get. Only 3 of his 22 hits were for extra bases, so power is not yet part of his game by any stretch of the imagination. His muscular build suggests to me that this will come. As a second round draft pick, he has inspired high hopes from the front office, and he begins 2017, not yet out of his teens, at single-A Cedar Rapids. From this observer's perspective, he exudes a maturity beyond his years. How about a little bingle, Ben? My mother taught me that if I can't say something nice, then don't say anything at all. Well, I haven't found much to say here about Ben's season yet. But it's time for an update, regardless. Through Cedar Rapids's first 13 games, Ben has started in 8 of them (1 DHing), and in 32 plate appearances he is batting a meager .125 with no walks but one double. On a positive note, he has had base hits in each of his last two games - there, a budding hitting streak, that's something nice. And he's thrown out 2 of 5 base stealers for 40% - also nice. See, Mom, I tried. I'm looking forward to having better things to say at his next report. Another ten days, another update. Ben got a hit yesterday against Peoria. Hopefully, this is a better harbinger than my last observation, which presaged this present five game stretch in which his season batting average actually decreased, to an even .100 at this writing. He's seeing more bench time, and is not being used as DH on his days off from behind the plate. I want to mention "Batting Average on Balls In Play", the notorious BABIP. Bear with me. Excluding strikeouts and homers, and maybe a couple of other outcomes I'm forgetting, experience has shown that major leaguers as a group come close to batting .300 when a fair ball is struck. And with few exceptions (extraordinarily speedy batters, for instance), neither batters nor pitchers show much ability to deviate from this norm for season after season. I don't like calling high or low BABIP (or a lot of other things that happen on a baseball diamond) "luck". If I were inserted into a professional baseball lineup, my BABIP would likely be a flat zero, and it wouldn't be a matter of luck. Let Mike Trout have some swings against high-schoolers, and expect a BABIP like .500 or .800 or maybe simply 1.000, and none of the kids would give him the stink-eye and mutter "lucky". But high or low BABIP has not been shown to be a reproducible skill in most cases for people, like major leaguers, who have some demonstrable skills, against opponents with skills. If a batter is struggling but his BABIP is .200, give him time; if a pitcher is struggling but his BABIP is .400, give him time. If the reverse is the case, expect the player to come back to earth. *cough* Danny Santana *cough*. I don't know whether this .300 benchmark carries over to the low minors or not. All this is meant as a lead-in to say: Ben Rortvedt has a BABIP this season of .125. He hasn't been striking out a super lot (10 out of 51 PA), and he hasn't hit any homers. (He's also walked only once, a very low number, but that has no bearing on BABIP.) So he's putting the ball in play frequently, and he's coming away with next-to-nothing to show for it. Probably what I'm seeing in the stats is due to frequent weak contact. But grounders do bleed through. Flares drop in. Opposing fielders zig when they should have zagged. Except for Ben, who apparently is getting none of this, uh, luck or whatever it is. Last year his BABIP was .235 in the GCL, where he batted .203. Brought up to the Appy League, his BABIP was .263, and his BA was .250. That's low, but not weirdly low. These numbers all reside in "Small Sample Size" territory, so I don't think it's wise to draw deep conclusions. What I'm suggesting is, 2017 Ben may not be that different from 2016 Ben, except for the hits not dropping in. If I'm management, I'm staying the course (assuming his work behind the plate has remained good), particularly since the rookie leagues don't start for a while yet (so there is no alternative way to demote him to easier competition for a little confidence-building except Extended Spring Training). None of this is meant to say that Brian Dinkelman, his hitting coach, doesn't have his work cut out for him regarding Rortvedt. My armchair analysis is to suggest not worrying so much about striking out, and accept a higher K rate (for the time being) in exchange for maybe stinging the ball a little harder when he does make contact. But maybe it's something more specific, like getting fooled into weak contact on breaking pitches or whatever. In any case don't over-coach; make your best suggestion, then sit back a few weeks and let him work through it. In any case, bottom line: better luck going forward, Ben! Or more to the point: better BABIP, Ben! Ben drove in 2 with this double tonight (May 3). Seth offered a nice paragraph on Ben in his Kernels Report this week. I liked the drafting of Ben, I was excited they got him to sign and I am becoming very excited about the type of prospect he's quickly becoming! Ben singled in the second inning to score Caleb Hamilton from second base, in a 6-5 win over the Dayton Dragons on May 10. His season batting numbers remain low, with a .107 BA and only 2 doubles and 2 walks. He continues to get significant playing time, but not every day, having started at catcher in 19 of Cedar Rapids's 32 games plus one start at DH and one game where he subbed. Rortvedt had his first multi-hit game of the season, going 2-4 and scoring a run in the Kernels' 7-4 win over the Peoria Chiefs Wednesday afternoon, raising his batting average. Hopefully this is a precursor of things to come. *shrug* The cliche in baseball articles is to say "raising his batting average to .285" or whatever. I just decided to have a little fun since I dislike specifying a number so low any more often than I have to. "Accentuate the positive, eliminate the negative," and I'm on the fence concerning Mister In-Between. Ben had another productive game, this time in the 4-2 win over the Wisconsin TImber Rattlers on May 20. He did a little of everything: singled, doubled, walked, scored, and drove in a run. The single was on a bunt with a man on first, so I'm uncertain whether our catcher was going for a base hit or just attempting a sacrifice - but the official scorer saw it as a hit and, as they say, it looks like a line drive in the box score. His double in the top of the fifth was indeed of the line-drive variety, pulled left. Both base hits raised his batting average. One thing he didn't do: strike out. Nice game. Ben Rortvedt scored the winning run in Cedar Rapids's 12-inning 6-3 victory. True, Jermaine Palacios clobbered the home run, but Ben was perched at second base in front of Aaron Whitefield when the Palacios blast occurred and was thus first in line to break the tie. So that's my analysis of the bottom of the 12th. Ben struck out his first two times up, but singled 2 of his next 3 times, for a nice 2-5 day, raising his batting average. Oh, and: nice article on Ben by Seth today. Ben drove in both of his team's runs on Memorial Day, May 29, with an 8th inning single, but it wasn't enough as the Kernels fell to the Kane County Cougars 3-2, wasting a pretty good outing by starter Clark Beeker. Rortvedt got his first 3-hit game of the season on June 9 versus Burlington, driving in 3 runs, and followed up yesterday, June 13, with a 2-hit game at Quad Cities, both scoring and batting in 2 runs. For the month of June, he is hitting a robust .348. A couple of doubles plus four walks give him an OPS of .899. Really, starting from mid-May he's been doing just fine, hitting .275 since May 17 - the hits have finally started falling in for him, with a BABIP in that span a representative .319. No need for a mid-season reset in Elizabethton - leave him in Cedar Rapids the rest of the year. Here's hoping we are now seeing our first sampling of the real Ben Rortvedt. Indeed, Ben went 3 for 5 in the Kernels' 16-3 laugher over the Clinton LumberKnaves, with his first homer of the season, a two-run opposite-field shot in the 8th. He garnered two singles and also got on base via an error, and nearly scored every time he reached base, except for making it only to third base in the seventh when a Lewin Diaz groundout into a double play snuffed that rally. He did strike out once. The game raised Ben's season batting average. .324 the last 10 days with 6 walks and 6 strikeouts. Good little run and he seems to be making some positive adjustments. .229 OPS in April. .510 in May. .891 so far in June. Ben got a single and a double in four plate appearances, scoring a third-inning run, in Cedar Rapids' 4-0 victory over the Bandit City River Quads on June 22. As noted above, his June numbers are very good, currently at a .341 BA forming the basis of a very healthy .925 OPS. His season batting average continues to rise.